Today I found out why we throw coins into fountains and how the tradition got started. People have been throwing coins into fountains seemingly as long as there have been coins and fountains. The tradition all started with water. Water, of course, is vital to sustain human life. While many people in the developed world today have clean, drinkable water readily available from their kitchen taps, this was not always the case. Potable drinking holes in many regions weren’t the easiest things to find. Thus, where clean water was available, many early European tribes believed that such areas were a gift from the gods. One rather prolific well can be found in Northumberland, England, and was used to pray to the Celtic goddess of wells and springs, Coventina. 16,000 coins from different eras of the Roman Empire were found there. Interestingly, most of the coins found in the Coventina Fountain were low denominations, much like today where people are usually more willing to part with a 5 or 10 cent coin rather than a full dollar, euro, or pound. Of course, it wasn’t always coins. The Well of Pen Rhys in Oxford, England called for pieces of clothing to be tossed in. In this case, it was thought that the water had healing powers and that the clothing carried disease, so by tossing a button, pin, or piece of fabric into the well, you would be healed. The belief in the healing powers of the Well of Pen Rhys remained popular well into the 18th century. These days, believing in gods watching over the wells or the thought that water has healing powers has largely lost favour, but people still practice this ancient tradition, in modern times usually making a wish. Probably one of the most famous examples of a wishing fountain is the Trevi Fountain in Rome. The Trevi Fountain was built as the ending point of a 21 kilometre long aqueduct called Virgo, named for the goddess who would guide soldiers to water when they were thirsty and tired. Originally, tossing a coin in or taking a drink from the fountain was supposed to ensure good health. Eventually, the tradition evolved to what we know today: if you toss a coin over your shoulder into the fountain, you will one day return to Rome. This idea was popularized in the 1954 film Three Coins in the Fountain, which also suggested that if you throw two coins in, you’ll fall in love with a Roman, and if you throw three coins in, you’ll marry him or her. Since the movie, this practice has become so popular with tourists that it’s estimated that around €3,000 in coins are thrown in the fountain every day. Obviously, all of those coins can’t just sit in the fountain forever. The Trevi Fountain shuts down for one hour every day and the coins are swept out by the Roman Catholic charity Caritas, which pays for food for the poor as well as Aids shelters. The coins have to be cleaned, sorted into different denominations, and sent off to the bank. As for what happens to coins in other fountains and wishing wells, you’ll sometimes run across a sign saying “proceeds go to…” which makes it pretty easy to figure out where your coins end up. Lacking a sign, however, it’s most likely that your coin will be collected and donated to a charity, or perhaps put toward the upkeep of a historic building or a zoo. 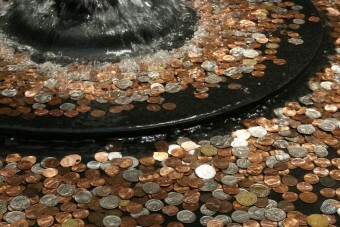 Even the coins thrown in fountains owned by private businesses tend to be donated rather than kept by the business itself. Tossing coins into wells and fountains isn’t always good, however. Despite starting out as a “thank you” to the gods for providing clean water, all of those coins present the possibility of contaminating drinkable water sources. They can also clog up fountain mechanisms, causing the fountains to break down. Because of these issues, in some places fountains and wells have signs up asking people not to toss coins in. The tradition is so ingrained, however, that people often don’t comply. Coins in fountains—particularly popular ones like the Trevi Fountain—are a haven for thieves. Roman officials have only recently cracked down on people scooping up coins from the Trevi Fountain, and since then the charity Caritas has seen a 30% rise in revenue. There is a small fountain to the side of the Trevi. Supposedly, if a couple drinks from this fountain, they will be faithful to each other forever. Given the number of microbe-ridden coins thrown in the fountains, perhaps it would be best not to drink from it. The Trevi Fountain gets its name from being the meeting place of three different roads. I don’t know if this is true but I have also heard that earlier coins used to be made of copper. And copper act as water purifier. That was one of the reasons this all started plus the things mentioned in this article. Not sure taking coins out of a fountain constitutes theft. Sure it is frowned upon, but really all it is, is a person picking up discarded money, no different than picking a quarter up off the ground. So are they thieves? Noooope. More like vultures or opportunistic hunters, but not thieves. Also if you are having to pick up money out of a fountain… perhaps you need it equally as badly as the charity that has laid “claim” to it. It is a fountain, not a coffer, and there fore pretty much up for grabs unless otherwise specified. I believe Aids should be AIDS. It is, a frequent DIY suggestion to place a bit of copper in birdbaths to keep it moss free. It seems to work for our birdy friends. I’m surprised that the curse tablets weren’t mentioned! The Celts while in Bath would throw in coins, jewelry, other personal possessions, and curse tablets as offerings to Aquae Sulis, today known in Bath as the Roman Baths. The curse tablets were thrown in to invoke a curse against someone that had done the person wrong and hoping to have something horrible done back. This is a form of an african ritual practiced by Puerto ricans,it like other rituals has been watered down.no pun intended.